Glass substrate R-beveling machine - SHIRAI TECH, LIMITED. 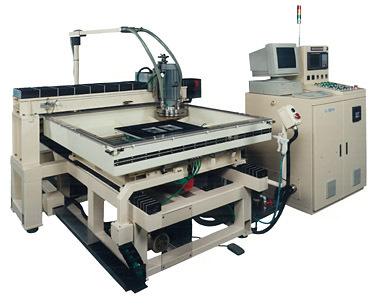 This machine has been developed for performing R-beveling on relatively large CF, TFT and PDP panels. By inputting the R-corners, orientation corner, corner-cutting pattern and glass size, the computer will automatically create all glass pattern data, and the CNC control unit will operate the grinding machine with a grinding accuracy (outer size accuracy) of under ±50µm. Also, the table is a suction (vacuum) holding-type which firmly holds one side of the glass (without actually touching the glass surface) to prevent movement of the glass during the operation and achieve highly accurate perpendicular and ground corners.